Can Herniated Discs Really Heal? 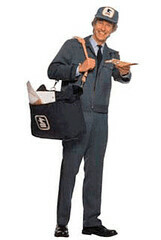 Reaching into the old mailbag again today. Here’s a question from a reader who is concerned that her herniated discs won’t heal because she read that they have no blood supply. I have been to your website several times and re-read many of the articles. Here is my story: In late May 2007 I started having low back pain on my left side. My past history has been bouts with this (so I had been going to a chiropractor 1-2 times a week for several years – I was fine (pain free) – until May when I started to have problems. He increased my visits to 2-3 times. I did that till the end of this past Aug. 2007. I really was hurting and couldn’t stand for longer then 10-20 minutes. Then I ordered Lose the Back Pain (workbook & videos) tried that for about 3 weeks (dedicated) nothing seemed to even be happening. Then I went to have DRX9000 – decompression pulls (18 pulls). They were horrible – I screamed, passed out after the 18th one cause of shooting pain and muscle spasms after getting off the machine. The Doctor agreed that 2 more (20 was the prescribed treatment amount) wouldn’t make a difference. I finished those about 3 weeks ago. Now $6,000 later I feel no better. Promises,promises!!! My concern is the 1st L5-S1. 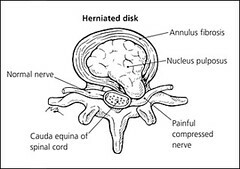 I understand what you mean about having herniated discs with NO pain – but the pain I’m feeling in my lower left back – which sporadically shoots out to the hip like a knife brings forth screams, and tears. [I read] that discs cannot heal because there is no blood supply. Can you please give me some more insight on everything I’m hearing about? Stories like yours make me very, very sad. It’s unfortunate that we consumers have to wade through so much misinformation, ignorance and foolishness before we (if ever) find the truth. On the subject of healing: It’s true that disks, ligaments, tendons and nerves all essentially have little or no significant blood supply but this does not prevent them from healing. It just means they heal slower than tissues (such as muscle and skin) that receive their nourishment from blood. So you see, herniated discs can heal despite the fact that they have little or no blood supply. After four weeks of severe sciatic pain and not being able to walk more than a few yards, I finally got in to see an osteopath last week. He said I might want to consider cortisone injections as part of the physical therapy. 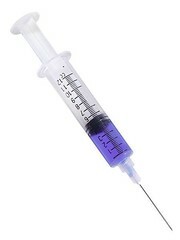 I read about epidural steroid injections in the forum but I’m wondering what you think of them. I’m glad you asked this question because I’ve been meaning to address this subject for some time now. Initially, I was skeptical of the use of steroids or other pharmaceuticals for treating back pain because of my long history of being a natural health nut. There was a time when I viewed anything coming from conventional medicine — and especially the big pharmaceutical companies — as some sort of toxic poison. I’m still not crazy about “artificial ingredients” so to speak, but I’d like to think I’ve gotten a little smarter when it comes to science, medicine and health over the past few years. My first experience with the therapeutic use of steroids came about in an unlikely and rather unpleasant fashion. A couple years ago one of the family cats came home dragging her hind legs. She was obviously injured so we rushed her to the Vet. Long story short, he gave her a steroid injection and sent her home with oral steroids to be given daily for the next week. Within a few days she was back up and around like nothing had ever happened. We still have no idea how she injured herself, but we were sure she was going to be crippled and would probably have to be put to sleep. Instead, she fully recovered. That was a real eye opener. Not long after that Ken (a.k.a. 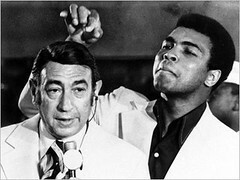 krd) started posting in the forum his experience with the epidural injections and how they knocked down his sciatica symptoms like Muhammad Ali taking on Howard Cosell. I couldn’t ignore the evidence after that. So now I’ve come around 180 degrees on the subject of steroids for the treatment of sciatica. If your doctor is recommending them for you, I believe they are definitely worth a try. Keep in mind that they don’t work for everyone. This is probably due to the fact that sciatica has many possible causes and simply eliminating the inflammation may not do the trick. Also, keep in mind that the epidural will not heal anything. It only eliminates the inflammation and swelling, which should give you relief from the pain. This relief is your window of opportunity to proceed with physical therapy to correct the cause of your sciatica. Okay all you fellow writers and blog surfers out there, if you get off on shows like ER, Rescue 911… and my personal favorite the late, great Third Watch… you’ll love my pick for this week’s edition of Writer’s Block. I just discovered it this afternoon and I could tell right away that I’d found a winner. I’ve bookmarked it and added it to my blogroll so I can return to it again and again. And I think you’re going to want to do the same. It’s Michael Morse’s blog, Rescuing Providence. Now if you’re a little squeamish, you may want to proceed with caution. Not everyone is comfortable reading about stabbings, gunshot wounds, car accidents and sore throats. (Sore Throats?) What, you never called an ambulance for a sore throat? Anyway, this is not some fictional TV drama. It’s a very realistic look into the world of our first responders. It’s very much like riding shotgun with the EMS guys as they respond to emergency calls in the city of Providence, Rhode Island. Now you may not think of Providence, RI when you think of big city drama, but apparently they get their fair share of the action. Morse is not only a firefighter, EMT and medical blogger, but a fellow author as well. Turns out, he’s written a book about his experiences as an EMT entitled – what else — Rescuing Providence. In Rescuing Providence, Lieutenant Michael Morse of the Providence, Rhode Island, Fire Department takes you along for 34 nonstop hours in the life of a big-city fireman/emergency medical technician. Ride through the tough streets of South Providence, the historic mansions on the East Side and the tattered but emerging West End as Morse and his EMS team respond to drug overdoses, heart attacks, car accidents, gunshot wounds, suicides, alcoholics, premature births, broken bones and other medical emergencies that are all in a day’s work for them. The brave men and women who make up our nation’s EMS system willingly risk their lives every day to save people they don’t know and often cannot communicate with. See for yourself how difficult, frustrating and at times heartbreaking this job can be, as lives are lost, scarce medical resources squandered, futures altered, and hope abandoned and then reborn. I thinks this is one you’re going to want to add to your reading list. What do you bet Homer wakes up with a crick in his neck? I’m 48 years old, self-employed and I don’t have insurance. I woke up this morning with severe neck pain… I had a whiplash injury several years ago and this feels exactly the same. Is this possible? Can you get whiplash in your sleep? It sounds like you may have just strained a muscle or ligament in your neck either while sleeping or perhaps sometime during the previous day. It’s also possible you slept with your head at a bad angle and simply need to give it time to relax. Don, the most common cause of neck pain is muscle or ligament strain. Naturally, since this is the same type of injury as your previous whiplash, it would feel very similar. In most cases the pain will subside within two to ten days without medical attention. However, if it lasts longer than that, you should see your doctor. Your head is off-center and you can’t hold it straight. Your neck pain is the result of a recent, serious accident. You have pain in your wrist or hand accompanied with a feeling of numbness or “pins and needles” in your fingers. You are having severe headaches that just won’t go away. Your pain is getting worse instead of better.